All the pieces are coming together in the parish hall, as we get ready for the annual Christmas Bazaar at St. George’s. All the preparations are bearing fruit as the cookies and baking arrive, as the sewing, knitting and crafting work is set out on the tables. The months of planning and preparing are about to culminate this Saturday, November 6th when the doors open at 10 a.m. and close at 2 p.m. There are some fabulous finds at the White Elephant table, some great used books at another table, and plenty of great items for the raffle. 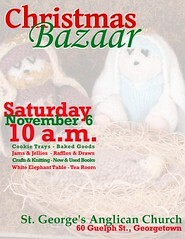 All the makings of another successful bazaar, and certainly a worthwhile stop for you and your family this Saturday.